When you connect your wallet to Totle, we display the Ethereum and ERC-20 tokens in that wallet. Track your allocations and the performance of each asset in a daily, weekly, annual, and all-time basis. Click the Trade tab and you can easily re-balance your allocations or add any supported ERC-20 token. You can even buy and sell multiple tokens in one transaction on the blockchain. All trades take place across our network of decentralized exchanges (DEXs). By aggregating order books from across the largest DEXs, trades are instant, liquid, and secure. 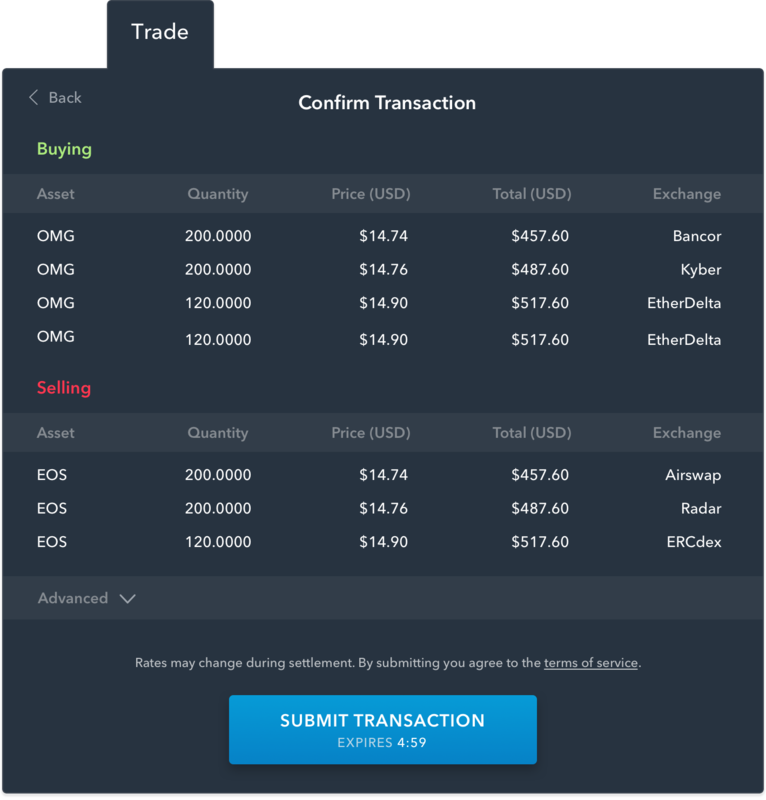 At launch we’re bringing together the order books of Kyber, Bancor, EtherDelta, and Radar Relay. More to come very soon! Totle only works with truly decentralized exchanges. Neither Totle nor any of the exchanges we've partnered with have any information that would allow us to execute a contract on your behalf. Only you have access to your private key. Interact with Totle simply by connecting your wallet. For now, Totle supports MetaMask and other browser-based web3 wallets, Ledger and Trezor. Support for mobile wallets coming soon. Totle aggregates order books across multiple platforms to combat the limited availability of orders. By pooling the fragmented order books among decentralized exchanges, the odds of filling your request increase greatly. While the Totle platform is free to use, some DEXs impose their own fee. Depending on the exchange that picks up your trade, a small percentage may be added to your transaction. Totle makes all fees clear on the Confirmation screen inside the Advanced tab.